If you answered "yes" to any of these questions, you might be a candidate for replacement windows. Lawson Home Services are the local experts for window replacement in Delmarva. Contact us to schedule a free quote for window replacement! We serve Bear, Wilmington, Dover and many surrounding areas. Cold Delmarva floors, windows and doors, oh my! Low maintenance. While old-fashioned wood windows required regular painting and even re-glazing, today's top-quality replacement windows are made from materials like vinyl, fiberglass and aluminum that are super-durable and maintenance-free. We install replacement windows manufactured by Sunrise Windows. Sunrise Windows come with a lifetime warranty. 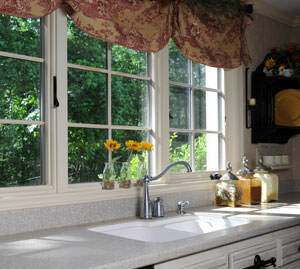 These vinyl replacement windows are the most energy-efficient, technologically-advanced windows on the market. Lawson Home Services installs replacement windows and doors with low-e glass, which help improve energy efficiency year round, as well as help block UV radiation and reduce condensation. It's also worth explaining that a replacement window is designed and sized to fit inside the frame (jamb) of an existing window. Lawson Home Services provides window replacement in Wilmington, Bear, Dover, as well as the surrounding areas of Middletown, Salisbury, Newark, Hockessin, Claymont, Berlin, Easton. Schedule a free estimate with us today!